The need of a central supervision not only existed in hospitals, but also – and even more – in asylums and prisons. The relation between a single point of observation (by a supervisor) and the architectural outcome of a tetradic design is not a coincidence, but reaches into the very heart of the quadralectic philosophy. The observer is in this latter disposition a conscious ‘point’, taking part in a cyclic movement. 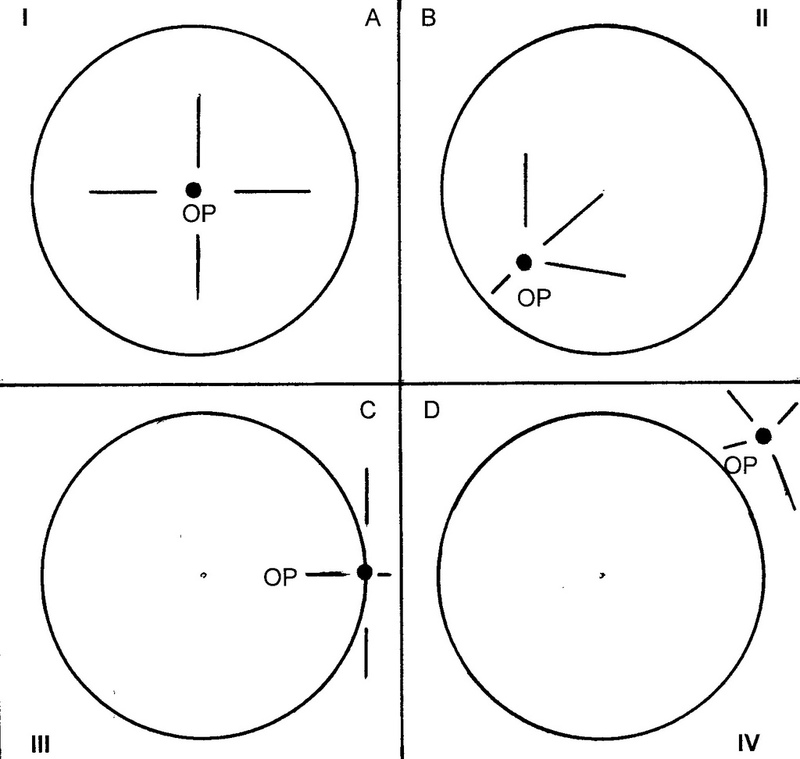 The choice of this observational point can be anywhere, but there are four distinct positions: either in- or outside the circle, on the circle itself or in the centre. These four occasions can be linked with the type of visibility in the subsequent (quadralectic) quadrants. The position in the centre (or middle point of the circle) is comparable with the universal visibility of the First Quadrant. A position in the circle provides the invisible visibility of the Second Quadrant. An observer on the circle has the dualistic visibility of the Third Quadrant, either looking inside or outside. And, finally, the viewpoint outside the circle is comparable with the visible invisibility of the Fourth Quadrant (fig. 358). Fig. 358 – The (theoretical) positions of an observer in the observational present (OP) are given here in relation to a general, cyclic communication. These positions match with the generalized types of visibilities of the various quadrants (I – IV) in the following way: A. In the center (I); B. In the circle (II); C. On the circle (III); and D. Outside the circle (IV). A building with a cross-structure or concentric layout offers at its center a point of observation with a maximum range of visibility. This situation can be interpreted in a reciprocal way (in a Third Quadrant setting): either the observer can see (and control) as much as possible or the maximum number of spectators can see the one in the center. Or, like Foucault (1975) put it: ‘The Panopticon is a machine for dissociating the see/being seen dyad: in the periphery ring, one is totally seen, without ever seeing; in the central tower, one sees everything without ever being seen’. One of the first architects to venture into the possibilities of centralized building with the intention of supervision was Johann Bernard Fischers von Erlach (1656 – 1723). This Austrian architect was born in Graz and became known as the ‘master of the Austrian Baroque’. He had a preference for ‘ideal designs’ and the buildings of ‘Roma antica’, in particular it’s domed structures. The Karlskirche (1715 – 1737, with a Corinthian hexastyle temple portico and a dome) and Schloss Schönbrunn (first design in 1688), both in Vienna, are his best-known achievements. He also worked in Rome (in his youth, starting as a sculptor, later calling himself an architect), Graz (mausoleum of Emperor Ferdinand II) and Salzburg (four churches). His book ‘Entwurf Einer Historischen Architectur’ (1721) is a rich source of information (KUNOTH, 1956). 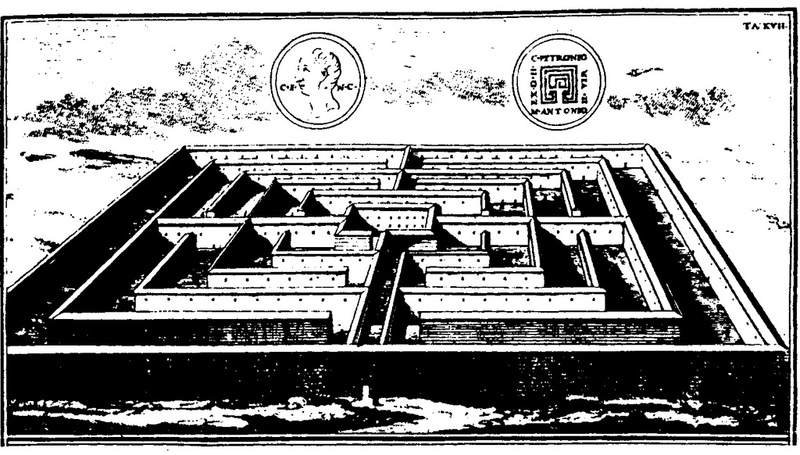 Fischers von Erlach’s contribution to early prison architecture was an imaginary reconstruction of the Cretan labyrinth as a prison. He did not yet use the (central) vantage point of supervision, but he realized the difference between the multitude (of a labyrinth) and the unity of the enclosure as a means to deprive people of their freedom. His design (fig. 359) fore-shadowed the tension between the restrictive nature of the Third Quadrant and the uncertain world of the Fourth Quadrant. Places of confinement – being the result of human considerations – went through the same historic development as the (European) culture-as-a-whole. Fig. 359 – The Austrian architect Johann Fischers von Erlach (1656 – 1723) used the classical design of a labyrinth – and its multiplicity – to visualize the enclosed unity of a prison. The prison-theme of multiplicity and its gateway to infinity was treated in a special way by the Italian architect and engraver Giovanni Battista Piranesi (1720 – 1778). A memorable set of etchings appeared in the years between 1749 – 1761 in two distinct editions called the ‘Invenzioni di Carceri’ (Imaginary Prisons) (FICACCI, 2000/2006). The total of sixteen plates showed the interiors of imaginary prisons, consisting of arches and faults, stairs and bridges and defying the laws of perspective (fig. 360). Most plates (except the numbers II and V) showed a development in some sort, with a lighter first and a darker, more complicated version later. Piranesi produced, besides this set of sixteen plates, many more etchings. His ‘Vedute di Roma’ (Views of Rome, 135 plates) is probably the best known. Further series of two hundred and twenty plates, depicting ‘Roman Antiquities’, three hundred and fifty plates of ‘Antique Statues, Vases and Busts’ and forty-seven plates for the ‘Magnificence of the Romans’ established his fame as a great Italian artist, reviving a glorious past. Fig. 360 – ‘The Drawbridge’ is the seventh plate (second state) from the series Carceri d’Invenzione (1749 – 1761) by Giovanni Battista Piranesi (1720 – 1778). It represents an imaginary prison. The early ‘Romantic’ travelers and tourists on their Grand Tour were eager to come home with those realistic pictures of Rome and Piranesi’s son Francesco continued to publish his father’s work in Paris between the years 1800 and 1807. Since then, the ‘Vedute di Roma’ remained collectors-items for a long time to come. The ‘dark’ and grim aspects of the prisons and the claustrophobic horror vacui of the plates attracted the ‘Romantic’ viewers, because it pointed to a troubled and/or tormented mind. The display of the prison as a deterrent, public punishment had taken on a whole new shape and meaning, aiming directly at the sentiments of the observer. This reaction, which started with Piranesi own enthusiasm in the early forties of the eighteenth century, fits in a general tendency of a viewpoint, which shifted from the Third (historic-visible) to a Fourth (present-invisible) Quadrant. The year 1800 has been determined to be that specific point in the European cultural history. The Narrenturm (Fools Tower) in Vienna (Austria) is the archetypal building of this change in attitude from factual to sentimental (fig. 361). Fig. 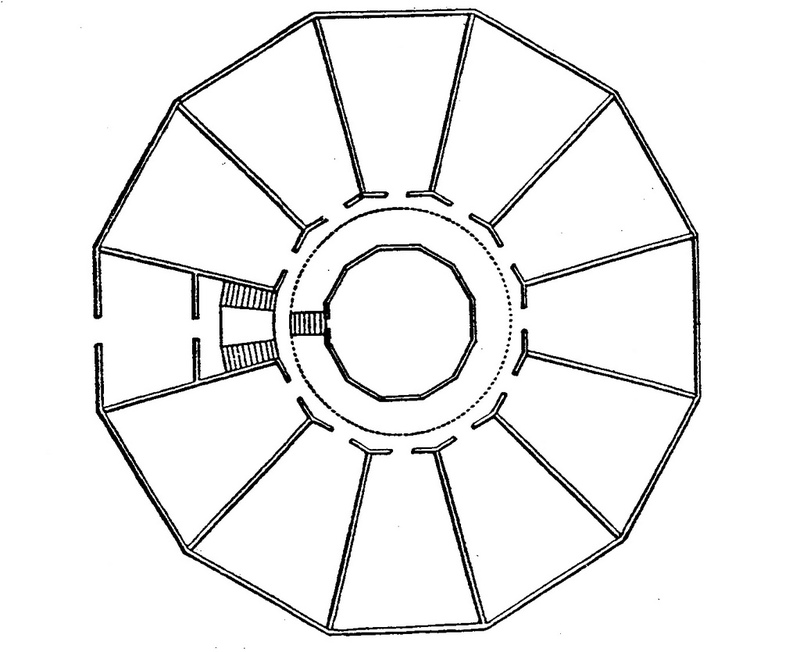 361 – A plan of the Narrenturm in Vienna (Austria), initiated in 1784. The asylum of Vienna was built under Emperor Josef II in 1784 by the architect Isidore Canevale, with practical advice from the hospital director Joseph von Quarin. The building had a round shape and was five stories high. The Narrenturm is now the Federal Pathologic-anatomical Museum (Pathologisch-anatomische Bundesmuseum) in Vienna (Austria). The round shape of the building might have been inspired by the knowledge that such a design can accommodate the greatest number of patients in the least space, but that general opinion seems not likely. Alfred STOHL (2000) suggested that the unusual shape of the building is the result of iatromathematical ideas, leading to a healing effect on the inmates. Scientific and occult number symbolism, working like a kind of ‘Genesungsmachine’ (healing machine), might have replaced the physical constraints. The inner chaos of the mentally ill can be channeled into the cosmic order of the building. There were twenty-eight cells within each of the five stories, pointing to a sun cycle of twenty-eight days. The tower double functioned as a star observatory. Joseph II was a believer in the principles of ‘iatromathematik’, a form of ‘healing power of numbers’. This branch of science was initiated by the polymath Giovanni Borelli (1608 – 1679). He was born in Naples and a possible pupil of Tommasso Campanella (1568 – 1639). The latter was the writer of the ‘Civitas Solis’ (City of the Sun) (see p. 796). Borelli’s interests ranged from dissections in Pisa to mathematics, hydraulics, cartography and meteorology. He concentrated on the corpuscular or mechanical philosophy. At that same period (end of the eighteenth century) the French architect Ledoux produced sketches for a prison in Aix-en-Provence (fig. 362), characterized by a square-panoptical design. He might have been inspired by the geometric ideas of the Renaissance architects before him. He searched for boundaries in limitation and order – and was less concerned with the psychological principle of central supervision. Fig. 362 – Perspective view and plan of the second floor of a prison project at Aix-en-Provence by the French architect Ledoux (1783/1785). The English reformer Jeremy Bentham was earlier mention (p. 434) as an active promoter of supervision in a circular environment (fig. 363). His book ‘Panopticon; or the Inspection-House: Containing the Idea of a New Principle of Construction Applicable to Any Sort of Establishment, in which Persons of Any Description Are to Be Kept Under Inspection’ (1791) is a milestone in social engineering. The warden (observer) in a panoptical situation creates the advantage of seeing the whole (of the inmates) without being seen by the population. Fig. 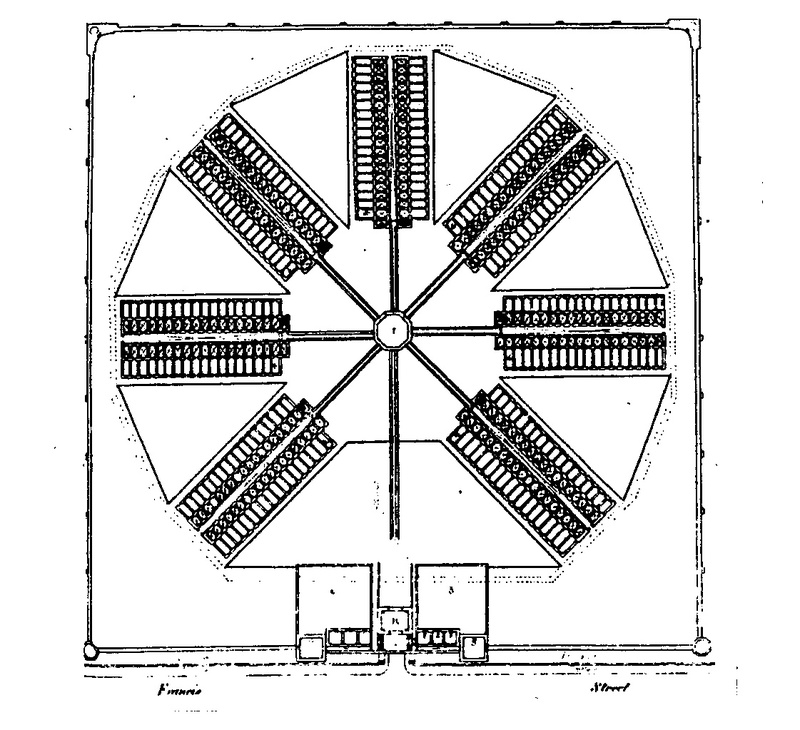 363 – A centralist design for a prison by the English scholar Jeremy Bentham introduced in his first Panopticum Prison project in 1797. Bentham’s book on the panopticon prison was preceded by his main work ‘An Introduction to the Principles of Morals and Legislation (1789/1822) in which he developed a ‘utilitarian’ theory. The principle of utility was earlier described by the Scottish philosopher David Hume (1711 – 1776). The latter pressed the ideas of John Locke (1632 – 1704) and George Berkeley (1685 – 1753) to their logical conclusions and ended in a world of skepticism, where everything came down to perceptions. All thinking was a matter of belief. Our beliefs of cause and effect depend – in Hume’s view – on sentiment, custom and habit, and not upon reason or some abstract general Law of Nature. Jeremy Bentham extended Hume’s conceptions to the principle of the greatest happiness. The actual outcome of an action depended upon an increase or decrease of the general happiness of the people. In this way skepticism was deferred. Happiness became a method to avoid the dead-end of infinite oppositional thinking. A sentiment was introduced into the communication to act as a measure and provide a value for the future. To call Bentham a four-fold thinker would be too much credit. His search in all conduct and legislation ‘for the greatest happiness of the greatest number’ is a principle, which fits in the quadralectic specter. The sentiments of joy are on a psychological level located in the Fourth Quadrant of a communication. Bentham believed, on the other hand, strongly in the two-fold principle of pleasure and pain: ‘On the one hand, the standard of right and wrong, on the other the chain of causes and effects’ (Bentham, 1780). 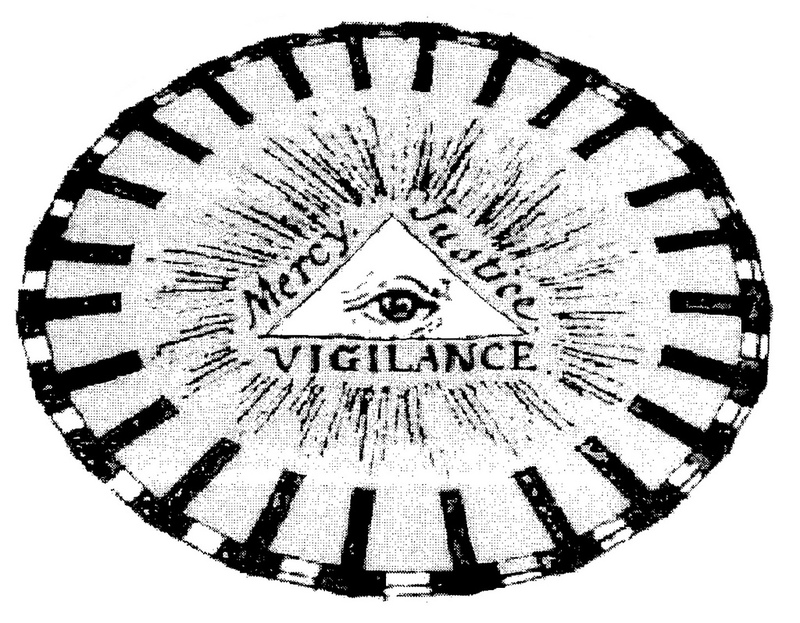 The three-division (Mercy – Justice – Vigilance), as found in the images of the Divine Eye, is drawn in one of his manuscripts and adds a further element of Bentham’s division thinking (fig. 364). Fig. 364 – The Divine Eye is seen here in a triangle, surrounded by Mercy, Justice and Vigilance. It looks into an oval confined space divided in many (twenty-four) compartments. This sketch by Jeremy Bentham includes the elements of unity and multiplicity, driven by an initial three-division. 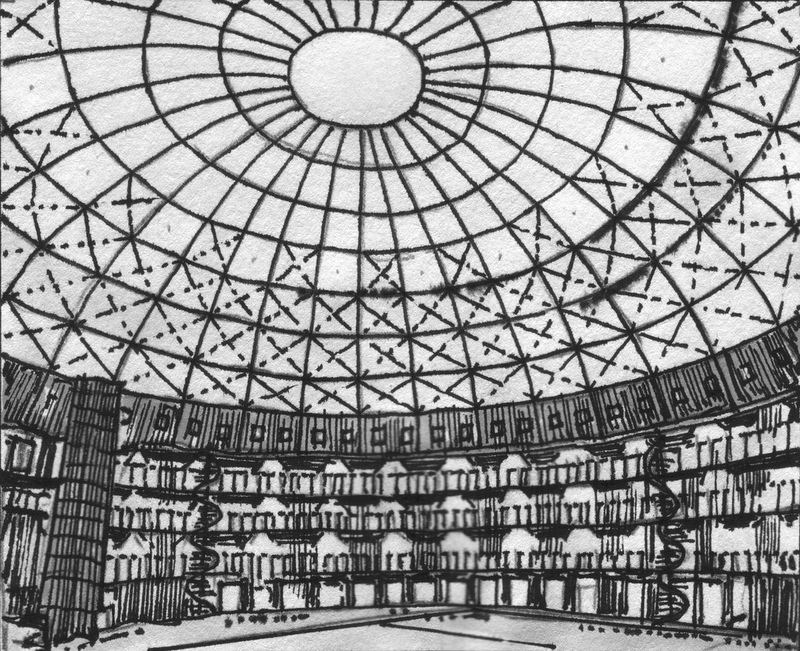 Bentham applied his ideas (of a panopticon) primary to prisons, but the word became in due course an expression for all sorts of buildings, which allowed a central supervision. Thinkers like Michel Foucault made a further link of an all-inclusive, panoptical control to a totalitarian environment. The shift from ‘happiness’ (or contentment as John Stuart Mill (1806 – 1873) preferred to call the aim of utilitarianism) to ‘power’ and ‘control’ is note-worthy in its own right. The spirit of the time around 1800 was focused on a development of the masses in their well-being, including those with a disturbed mind. Circumstances for psychiatric patients improved (JETTER, 1981). The Communist managerial system (after the Revolution of 1917) stretched the definition of the mentally ill to include enemies of the state, but it failed some seventy years later. The Western world fell back in an oppositional system (Cold War) to direct the mind of the population – emphasizing, ironically, the concept of freedom. Their dualistic approach lost its credibility after the fall of the Berlin Wall in 1989. Control of the masses – under the modern noun of ‘war on terror’ – takes a new turn in the form of data control, which is geared towards individuals rather than masses. Bentham’s panoptical ideas are now embodied in the scanning of the Internet for subversive individuals. They have given rise to paranoid actions on airports, when every passenger is searched for implements, which could endanger the safety. Essentially, the search is on for persons, who push oppositional ideas too far – although it is hardly interpreted as such. A lower-division frame of mind, based on fixed opposition, can end up in a suicidal act, in a last attempt to further a cause, religious or otherwise. The Glasgow Lunatic Asylum is one of the first institutions in Great Britain to use a saltire plan with its wings radiating from a central, octagonal block (fig. 365). The hospital in Parliamentary Road was designed by the Dunfermline-born architect William Stark (1770 – 1814), who was an important figure to the development of the Classical revival in Scotland. Fig. 365 – This plan of the Glasgow Lunatic Asylum, dated 1810, indicate a four-fold scheme with a system of classification of patients based on oppositional values. The opening of the asylum took place in 1814. The institution gained a Royal Charter in 1824. The internal division of space showed segregation both by gender and social class (and thereby a distinct oppositional awareness, despite the radial-panoptical nature of its lay-out). The West House was for private patients and the East House was for paupers. The capacity of fifteen hundred beds made it one of the largest hospitals in Britain at the time. The checked history of the building saw a transfer into a City Poorhouse in 1843, when the asylum moved to new premises at Gartnavel to the west of Glasgow. The original building was finally demolished in 1910. 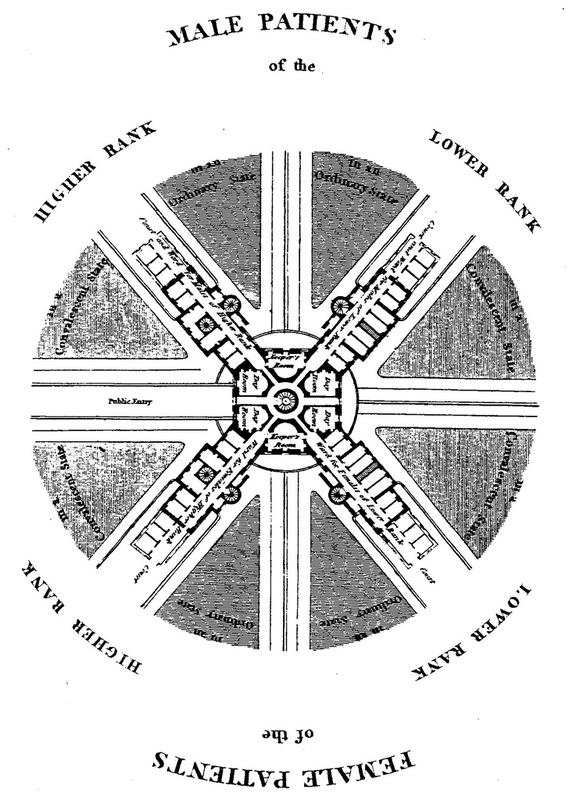 A good example of a prison, which was built according to the ‘Benthamian scheme’ of mass control, is visualized in the prison of Cherry Hill (along Fairmount Street) at the outskirts of Philadelphia (fig. 366). The prison was described by Negley K. Teeters (‘The Prison at Philadelphia’, 1957) and mentioned by Michel Foucault (in ‘Discipline and Punish’, 1975/1977). The penitentiary in this city has been associated with the ‘Separate System’ (or Auburn System), in which every prisoner is locked in an individual cell. This isolation forced the prisoner to reflect upon his crime. Fig. 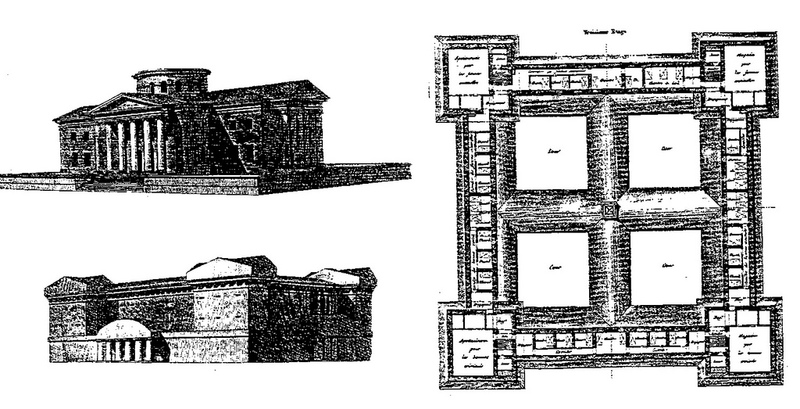 366 – A plan of the Eastern State Penitentiary at Cherry Hill in the outskirts of Philadelphia as depicted by De Beaumont and De Tocqueville (1833). This octagonal building had a central part, which was used to watch the cells in the seven blocks. The prison functioned between 1829 and 1971. Foucault pointed to the monastic origins of cellular confinement and the religious source to alter people and ‘correct’ them to an acceptable social behavior. He expressed the social context in terms of power. However, he did not place the mental setting in an environment of division thinking. The Egyptian Desert Fathers of the third century AD, who lived as hermits, Simon the Stylite in the early fifth century in Syria or the Quaker ideals of Robert Vaux at the beginning of the nineteenth century had a limited type of division thinking in common. The early nineteenth century – interpreted as the beginning of the Fourth Quadrant of the European cultural history – saw the disintegration of dualistic thinking and the start of a great debate about human feelings and dignity. The (architecture of) prisons and asylums reflected that change. The bad treatment of the mentally ill, often confined to enclosed places with shackles and chains, changed for the better towards the end of the eighteenth century when a new approach to the psychiatric patients and inmates swept over Europe and its (former) colonies. Bentham’s concept opened a view of a new type of multiplicity by stretching the opposition between the observer and the observed to its limits. The position became an all-important element of a (cyclic) communication. This crucial finding was only possible after new space was created by higher division-thinking. The panopticum brought this difference to the foreground. The linear, hierarchical outlook was gradually replaced by a circular vision. The latter view implies four types of observational situations (as given in fig. 358), including the panoptical position. Philosophers realized that this insight needed a redefinition of power. The panoptical concept remained alive in the nineteenth and early decades of the twentieth century. A number of prisons were built in the Netherlands just before the introduction of a new ‘Wetboek van Strafrecht’ (criminal code; 1 Sept 1886), anticipating the cellular system of confinement. The Dutch architect J. F. Metzelaar (1818 – 1897), designed several dome-type (‘koepel’) prisons in the Netherlands. Initially, in a cross-shape fashion with a central hall (like in Groningen (1881), Scheveningen (1882) and smaller ones (in Alkmaar (1883) and Zutphen). Soon thereafter real panoptical domes appeared domes in Arnhem (1883) and Breda (1886; fig. 367). His son, W.C. Metzelaar, designed a simpler version in Haarlem between 1898 – 1901 (fig. 368). Fig. 367 – The dome-roofed prison in Breda, build between 1883 – 1886, by the Chief Architect for Prisons and Courthouses Johan Frederik Metzelaar, with assistance from his son Willem Cornelis. Also note the medieval type of gatehouses. Fig. 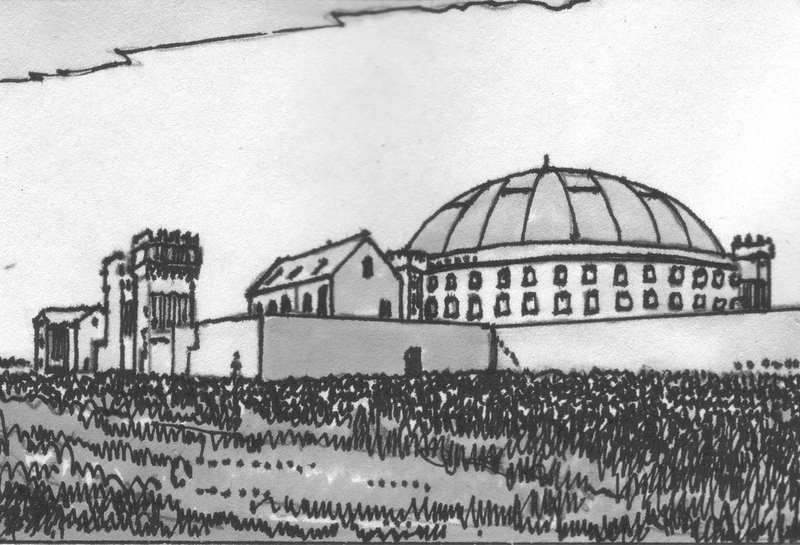 368 – The inside of the prison in Haarlem (The Netherlands), which has, like other prisons in that country (like Arnhem and Breda), a round shape to facilitate supervision. The diameter of the dome is just over fifty meters. This short survey could lead to the conclusion that the subject of prisons and asylums is full of contradictions. 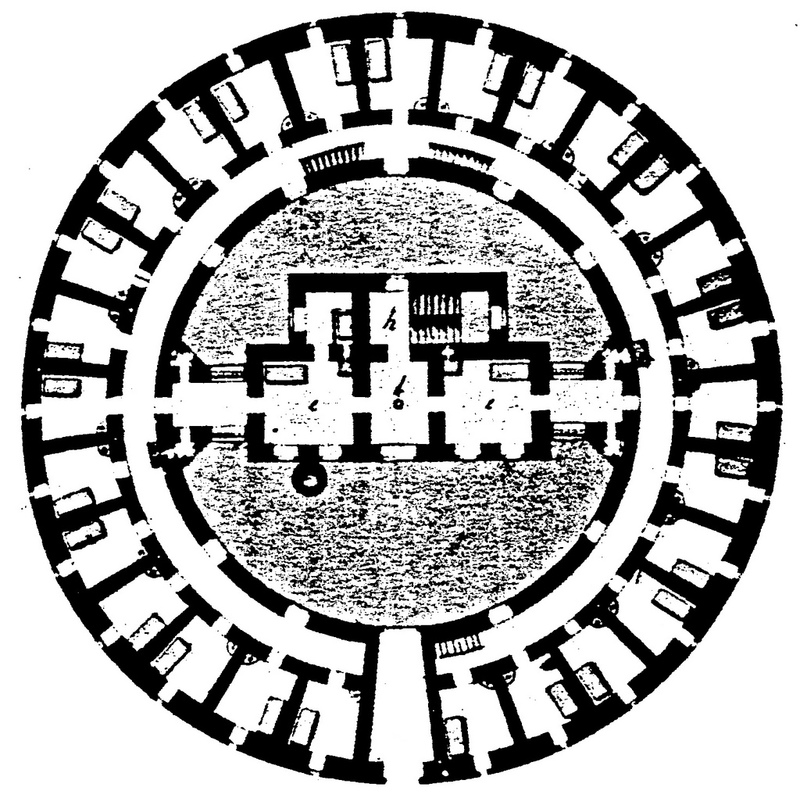 Circular and domed prisons spread a symbolic message of the unity of infinity, but for the inmates this type of building refers to restriction and loss of personal freedom. This disposition of quadralectic architecture is like a Janus-face, just like any other subject in an oppositional environment. The introduction of this chapter pointed in a communication to a position on the circle (fig. 358) . This setting cuts the universal space in half (either inside or outside) and highlights the dualistic elements in a communication: freedom of space against a limitation, freedom of movement against a confinement and freedom of creativity against supervision. The understanding of quadralectic architecture obtains in the dome or the panoptical layout of prisons and asylums its full depth. The restricted environment makes a human being aware of its supposedly committed crimes and punishment. The dome and its symbolic meaning gives also access to a Universal Communication, which can be symbolized in a ‘Great Circle of Being’. Architecture can point to a way of understanding. If life is seen as a type of confinement – locked in its temporary bonds of the human body – then the dome of our existence is comparable to the curved space of the universe and its imaginary limit. Our position as a thinking individual has to be defined in the interaction with infinity and can only be recorded when the boundaries and limitations are noticed and values are created. That assignment might be the real point of human existence, rather than trying to escape our confinement. 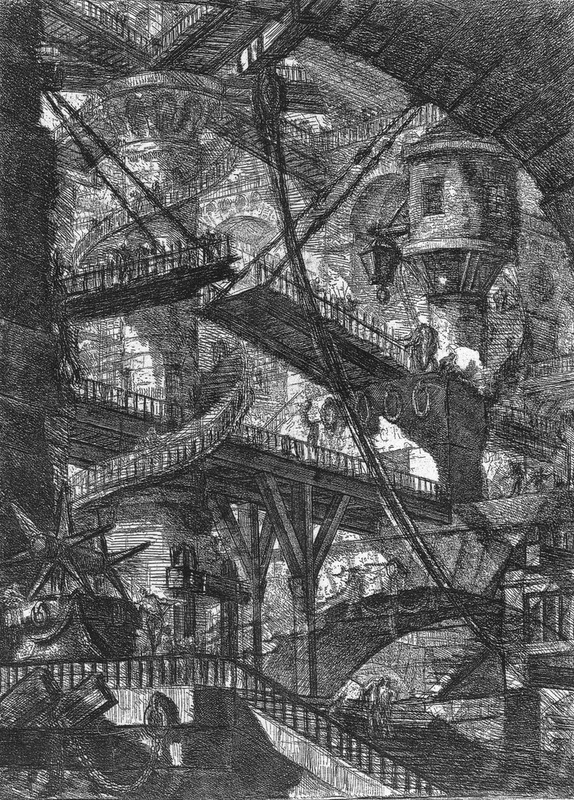 Piranesi heeft nu mijn aandacht. Ik meld me.